TUCSON, Ariz. -- Engineers operating the Robotic Arm on NASA's Phoenix Mars Lander are testing a revised method for delivering soil samples to laboratory instruments on Phoenix's deck now that researchers appreciate how clumpy the soil is at the landing site. "We're a little surprised at how much this material is clumping together when we dig into it," said Doug Ming a Phoenix science team member from NASA's Johnson Space Center, Houston. The soil's physical properties are proving to be a challenge for getting a sample intended for one instrument to pass through a screen over a delivery opening. The instrument is the Thermal and Evolved-Gas Anaylzer, or TEGA, designed to bake and sniff samples to identify some key ingredients. The analyzer vibrated the screen for 20 minutes on Sunday but detected only a few particles getting through the screen, not enough to fill the tiny oven below. "We are going to try vibrating it one more time, and if that doesn't work, it is likely we will use our new, revised delivery method on another thermal analyzer cell," said William Boynton of the University of Arizona, lead scientist for the instrument. The arm delivered the first sample to TEGA on Friday by turning the scoop over to release its contents. The revised delivery method, which Phoenix is testing for the first time today, will hold the scoop at an angle above the delivery target and sprinkle out a small amount of the sample by vibrating the scoop. The vibration comes from running a motorized rasp on the bottom of the scoop. 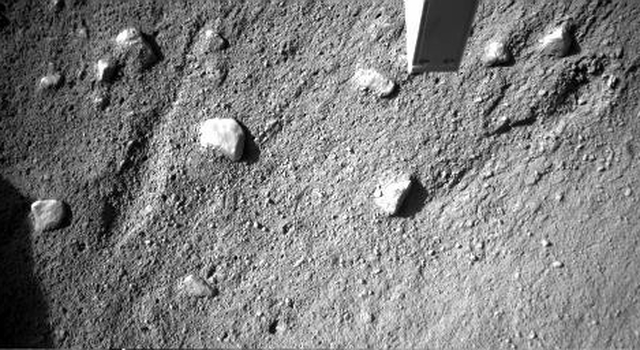 Phoenix used the arm Sunday to collect a soil sample for the spacecraft's Optical Microscope. Today's plans include a practice of the sprinkle technique, using a small amount of soil from the sample collected Sunday. If that goes well, the Phoenix team assembled at the University of Arizona plans to sprinkle material from the same scoopful onto the microscope later this week.